I never consider myself to be on trend, and definitely not an early adopter to anything. 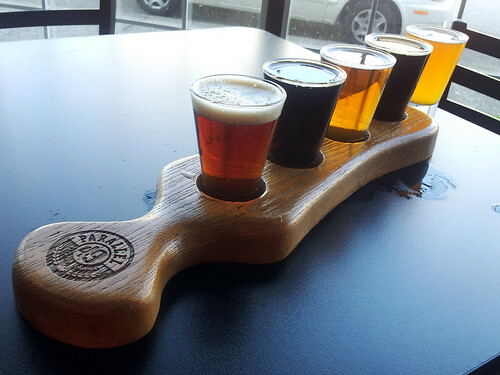 So when craft beer became popular in Vancouver, it took me awhile to catch on. Well, thanks to our friend Bryan, it took us no time to catch up. We have been holding Beer Nights where we would taste different kinds of beer brewed locally and beyond. Last winter, Mr. discovered and fell in love with a beer from Parallel 49. 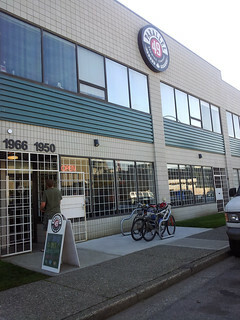 Now that this seasonal beer has returned, and in celebration of BC Craft Beer Month, we paid a visit to its tasting room located near Victoria St. and Triumph St. 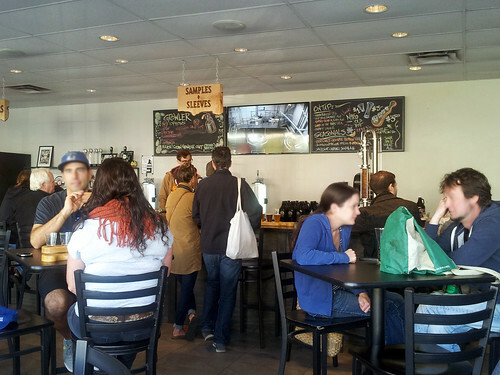 Almost all (if not all) current offerings are available on tap here at the tasting room. You can order a sample for $1 each, or 4 for $3.50; or you can order a sleeve of your favourite for $3. Yes, it’s pretty affordable here. And it gets very tempting. But then, we saw this interesting-looking tube at the end of the bar. 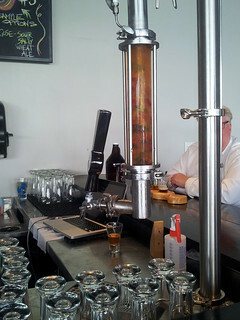 It’s an infuser attached to a tap that allows the beer to soak in the flavour very quickly through this pressurized tube. The idea is for them to try out different flavour combinations. The day we went they were infusing the Lord of the Hops (IPA) with Gummy Bears. Yes, gummy bears. This looked too cool and fun to pass up on, so we had to get a 5th sample. The 70IBU IPA has taken in the sourness and sweetness from the gummy bears. So to our surprise, this otherwise hoppy, bitter beer is now bearable (haha I’m funny! ), even for a non-IPA drinker like myself. In fact, I think the candy has dialed down the bitterness and enhanced the grapefruit peel note in the beer which made it taste better. I can’t believe I’m about to say this but I actually quite liked it! And I bet the gummy bears would taste very good too after absorbing all the goodness from the beer! You probably asked, “so which beer did Mr. fall in love with?” It was the Salty Scot. He kept an open mind while sampling, thinking something else might steal its place. In the end, the unique combination of salty savouriness and sweet, buttery caramel in Salty Scot still got Mr.‘s heart. He liked it so much he also filled up a growler of it. 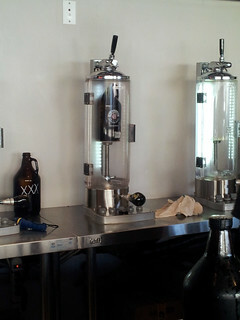 The growler itself would cost you a one-time fee of $5. Lighter beers cost $10 to fill, but Salty Scot, a strong beer, costs $12. There’s a limited quantity on these seasonal beers, so if you want to give them a taste, visit the Parallel 49 tasting room soon or if you are lucky, you may find it at a liquor store near you. Awesome post! Love it! We bought several bottles of the Salty Scot from BC Liquor last week. The store didn’t even get a chance to put the price tag on before I bought them! hehe. I am enjoying the P49 Ugly Sweater on these foggy Autumn eves as well!